Genomics is a branch of molecular biology relating to the structure, function, evolution, and mapping of genomes and more specifically relates to DNA, DNA sequencing methods and bioinformatics. Below is a list of fluorescent labels (specifically maleimides) including Zy-dyes that are commonly used for labeling of thiol-modified oligonucleotieds. They also include labels with long lifetimes for fluorescence lifetimes (FLT) and/or fluorescence polarization (FP) applications. new Staining of double-stranded DNA: YOSeta-1 is a cell-impermeant fluorescent dye used for staining of double-stranded DNA similar to YOYO-1. 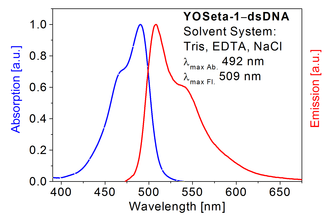 Unlike YOYO-1, YOSeta-1 is highly soluble in aqueous buffers. The free YOSeta-1 dye has a very low fluorescence quantum yield but the QY increases several thousand times upon binding to double-stranded DNA (see specs sheet). The probe is available as a 1 mM solution in DMSO.